With senior US officials due to visit Zimbabwe for talks in the coming week, the Vigil calls on them to remain focused on human rights issues, in particular the abduction of Itai Dzamara by CIO agents in Harare exactly two months ago today. Despite a court order to investigate his disappearance, the police appear to have done nothing to look for him and it is feared that he has met the fate of so many awkward opponents of the regime: tortured and killed. Bankrupt Zanu PF is desperate for money. Mugabe has taken to the streets of Moscow, begging bowl in hand, selling copies of his Big Issue: Zimbabwe Agenda for Sustainable Socio-Economic Transformation. He is unlikely to sell many Zimassets. Before considering giving yet more money to Mugabe, the American officials, Shannon Smith and Steven Feldstein, should enquire about the welfare of Richard and Molleen Dennis who have just been chased out of their home on Caledonia farm in the peri-urban area around Harare on the Arcturus road. The Vigil is informed by the Mike Campbell Foundation that: ‘On Tuesday afternoon a large group of people arrived in expensive cars. Many of them were drunk or high on drugs. Approximately 30 of them forced their way into the Dennis’s home and began manhandling and assaulting them. Richard was attacked with a golf club and his daughter was hit in the face but fortunately they did not need to be hospitalised. However, they were forced to leave their house with only the clothes they were wearing. They were not even allowed to take their phones, passports, spare clothes or their much-loved dogs, about whom they are extremely concerned. Their daughter is due to be married shortly and her wedding dress is also still in the house. Personnel from the Mabvuku Police Station refused to assist or even take a report. This modus operandi is typical of wealthy ZANU PF ministers and party elite who wish to take over valuable peri-urban land and divide it into plots for resale’. Of course, millions of Zimbabweans are suffering – not only the high profile victims but also the poor and vulnerable in Harare’s high density Mbare area. MDC T legislator Eddie Cross exposes in an article today the scams used by the Mugabe mafia to exploit the poor and at the same time to undermine the rule of law and democracy itself. You can read his article here: http://nehandaradio.com/2015/05/09/exploiting-poverty-and-desperation/. The Vigil hopes that Ms Smith and Mr Feldstein read this article before their meeting with Vice President Crocodile on Tuesday. The Vigil is not convinced that the way forward is to prop up Mugabe’s regime. We are also unhappy at pressure by donor countries for democratic forces in Zimbabwe to find common cause with expelled Zanu PF elements now suddenly bleating about human rights. · We were saddened to hear of the sudden death by heart attack of Catherine Muchabayiwa our friend from ROHR Birmingham Branch who died earlier this week. Thanks to Danny Kadiki for his heartfelt prayer for Catherine. There will be a memorial service for her at 1 pm on Saturday 16th May. We are postponing the Zimbabwe Action Forum scheduled for that day until 23rd May to allow people to attend. For details of the service and ZAF see Events and Notices. 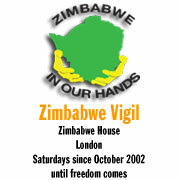 · The Zimbabwe Association’s exhibition in London shows fascinating glimpses of the Vigil’s 13-year history. The exhibition continues until 15th May at Oxford House, Derbyshire Street, London E2 6HG and then tours round the country. For opening times check: http://zimbabweassociation.org.uk/2015/04/27/12-years-exhibition/. · Thanks to Henrietta Mlambo, Esther Nyambi. Edward Mukuze, Fungayi Mabhunu and Mavis Chisvo for being at the start of the Vigil to help set up. Thanks to Mavis, Esther and Henrietta for looking after the front table. · Memorial for Catherine Muchabayiwa. Saturday 16th May at 1 pm. Venue: St Andrews Church, Oxhill Road, Handsworth, Birmingham B21 9RE. ‘Come and let’s celebrate a life that gave so much to others’. · ROHR Reading Branch Outreach. Saturday 16th May from 12 noon – 4 pm. Venue: Morrisons Reading, off Rose Kiln Lane and Basingstoke Road, Reading RG2 0HB. Come and support ROHR Reading Branch in our effort to fundraise for our local community. All funds and food collected will be donated to local foodbanks in Reading. For further details please contact: Nicodimus Muganhu 07877386792, Mary Eluwasi 07888310582, Deborah Harry 07748723974 and Shylette Chipangura 07828929806. · ROHR Southampton branch meeting. Saturday 16th May from 1 – 3.45 pm. Venue: Eastleigh Library, 1st Floor, Swan Centre, Eastleigh, SO50 5SF. Contact: Sally Mutseyami (Chairperson) 07448730581, Faith Shimongola (Vice Chairperson) 07500960117, Chipo Mtetwa (Organising Secretary) 07403341214. · Zimbabwe Action Forum (ZAF). Saturday 23rd May from 6.15 pm. Venue: Strand Continental Hotel (first floor lounge), 143 Strand, London WC2R 1JA. From the Vigil it’s about a 10 minute walk, in the direction away from Trafalgar Square. The Strand Continental is situated on the south side of the Strand between Somerset House and the turn off onto Waterloo Bridge. The entrance is marked by a sign at street level. It's between a newsagent and an optician. Nearest underground: Temple (District and Circle lines) and Holborn. The ignominious failure of the Mugabe regime’s court challenge to the sanctions imposed by the European Union has escaped much attention. That the challenge was a ludicrous waste of public money was obvious to the Vigil from the start – thrown into comic relief anyway by the gradual removal of the targeted measures. The court’s slap in the face for Mugabe should resound throughout Africa, which has been told by Zanu PF that the sanctions cost Zimbabwe fifty billion dollars. Zimbabwe must now foot the bill for this legal circus – and the bill will be sizeable given that it has been ordered to pay all the legal costs of the European Union, as well as its own expenses. Judging by the per diem allowances awarded to Zanu PF flunkies on their non-stop journeys abroad with Mugabe, this will be enough to put the final nail into the Zimbabwean economy! Except that, of course, Zimbabwe will not pay. Even now, the Vigil doubts that the Zanu PF propaganda machine oiled by Jonathan Moyo will give up the tired mantra of ‘illegal sanctions’. It has been a reliable prop for so many years that the party faithful recite it automatically as a reassuring slogan when discomforted by reality. And what else can Zanu PF use as a fig leaf for their gross incompetence and nepotism. Official statistics put Zimbabwe’s imports for the first quarter of this year at $1.6 billion against exports of only $716.6 million. That’s less than half. The trade deficit in March alone was reported as $340.2 million. In that month exports to our great Chinese partner amounted to the grand sum of $47,000. A least that’s what the official figures say. Nevertheless it is becoming clearer by the day that reality is biting home as a disintegrating Zanu PF fails to put in place a strategy to save the economy sinking like a stone. Any initiative by Finance Minister Chinamasa or anyone else for that matter is immediately stymied by Mugabe. The real sanctions against the Zimbabwe economy are shown to be his short-term expediency with the sole objective of preserving himself. He certainly does not seem to be interested in saving anyone else, notably the thousands of Africans drowning in the Mediterranean in a desperate attempt to escape violence, oppression, misgovernance and poverty – things he provides in abundance. While European governments met urgently to discuss the plight of migrants, the normally voluble AU Chair Mugabe was silent on the matter. But he knows why people are fleeing. And it’s not because of ‘illegal sanctions’. The well-attended Vigil was exhorted by ROHR President Ephraim Tapa: ‘we must not allow the world to forget Itai Dzamara’. · Before the Vigil there was another demonstration outside the nearby South African High Commission against the xenophobic violence. Among those there were South Africans who proclaimed ‘not in my name’. During the week Vigil supporters also took part in another xenophobia protest outside the High Commission organized by the human rights activist Peter Tatchell. · The Vigil welcomes the independence day message by opposition parties which said: ‘Zimbabweans must be ready to fight Mugabe as they did the Rhodesians. Just as we fought a brutal protracted struggle against white minority repression, so too must we be ready to redeem ourselves from the current penury, poverty and deprivation inflicted upon us by our own kith and kin. Independence is not enough without freedoms and prosperity and we must be ready to pay the ultimate price once again to save ourselves’ (see: Prep for new freedom fight, opposition – http://www.zimbabwesituation.com/news/zimsit_w_prep-for-new-freedom-fight-opposition/). · Thanks to Esther Nyambi, Fungayi Mabhunu and Ephraim Tapa who were there at the start to help set up and to Enniah Dube and Patricia Masamba who looked after the Vigil table. · ROHR Executive Meeting: Saturday 2nd May at 12 noon. Venue: Strand Continental Hotel (first floor lounge), 143 Strand, London WC2R 1JA. For directions see below. · Zimbabwe Action Forum (ZAF). Saturday 2nd May from 6.15 pm. Venue: Strand Continental Hotel (first floor lounge), 143 Strand, London WC2R 1JA. From the Vigil it’s about a 10 minute walk, in the direction away from Trafalgar Square. The Strand Continental is situated on the south side of the Strand between Somerset House and the turn off onto Waterloo Bridge. The entrance is marked by a sign at street level. It's between a newsagent and an optician. Nearest underground: Temple (District and Circle lines) and Holborn. · Next Swaziland Vigil. Saturday 2nd May from 10 am to 1 pm outside the Swaziland High Commission, 20 Buckingham Gate, London SW1E 6LB.